Kool Kahuna, under jockey G.R. 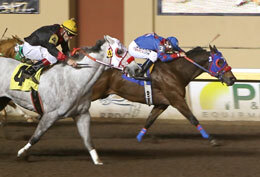 Carter, Jr., winning Remington Park's feature Allowance race on Thursday's race card. OKLAHOMA CITY, OK�MAY 8, 2014�Kool Kahuna has never finished worse than third in his career and kept that status going with a win by a head over Stroller in Thursday�s $23,900 allowance feature at Remington Park. Owned by Karen and Preston Cloud of Sallisaw, Okla. and trained by Guillermo Valdivia, Kook Kahuna had the services of leading rider G.R. Carter. After a good start, Kool Kahuna hooked up with Stroller and the two battled for the entirety of the 440 yards. Kool Kahuna edged to the lead late in the stretch and prevailed at the finish in :21.89 seconds over a fast track. Kool Kahuna was 4-1 in the wagering and paid $10.20 to win, $4.20 to place and $2.60 to show. Stroller, the beaten 7-5 betting favorite, paid $3 to place and $2.20 to show. TJ Blue Bank was a length behind the runner-up in third, paying $2.20 to show. A Texas-bred by WAVE CARVER from the Streakin La Jolla mare Sinnin Sister, Kool Kahuna won his third career race, his second overall at Remington Park. Through 10 career starts he also has five second-place runs and a pair of thirds. The winner�s share of the purse is $13,098, pushing the career earnings for Kool Kahuna to $52,469. The win on Kool Kahuna was the third of four on the night for Carter. He also prevailed with Indigo Lass ($5.60 to win) in the fourth race, CMe Leaving You ($3.20) and JM Freckled Eagle ($4.60) in the 12th and final race of the night. The four wins gives Carter 51 for the season, 14 ahead of Berkley Packer in the Remington Park jockey standings.